There are so many reasons to choose Norwex! My sister was the first person to introduce me to Norwex (a long time ago) and when I discovered facts like “of the 80,000 new chemicals that have been introduced in the last 50 years, approximately 200 have been assessed for their impact on human health,” or that, “only 5% of all plastic used globally is recycled. Plastic pollution now covers an area equal to 88% of the ocean’s surface”, it stirred a righteous anger in me to be a part of the solution. My dad died due to cancer… he was a farmer in beautiful Smithers BC and he (like many farmers) was exposed to countless chemicals during his career. Now 12 years later, I am proud of the positive impact I am having to help remove chemicals from households. Besides the impact that Norwex can make on our health, there are a lot of great reasons and ways to join Norwex. You can be a casual consultant (only ordering for yourself and family), you can be a part-time consultant (working to help pay the bills) or you can go all out (grow your business by leading a group of like-minded consultants). Whatever your interest is in Norwex, there is a place for you!!! 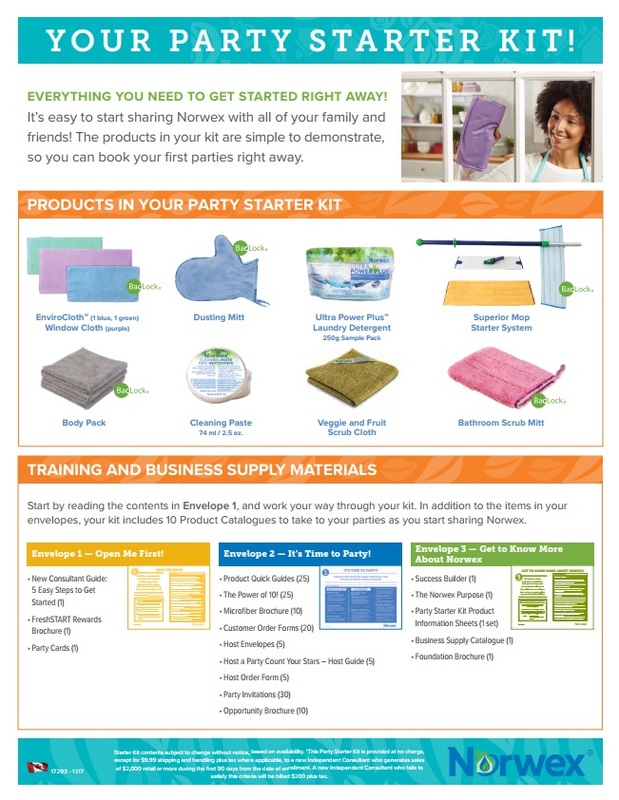 Host 2 launch parties… invite everyone you know both near and far (Norwex ships right to your door). Ask 2 friends or family members to host a party. Send out a Facebook announcement about your exciting new home-based business. I like to encourage new consultants to get “OUT THERE” right away! The first thing every new consultant needs is PRODUCT to demonstrate at their launch parties. Demonstration product is like a consultant’s tools of the trade. Customers love to touch, feel, try, ask questions and tell personal stories all about the products demonstrated. So the more product you have, the better! 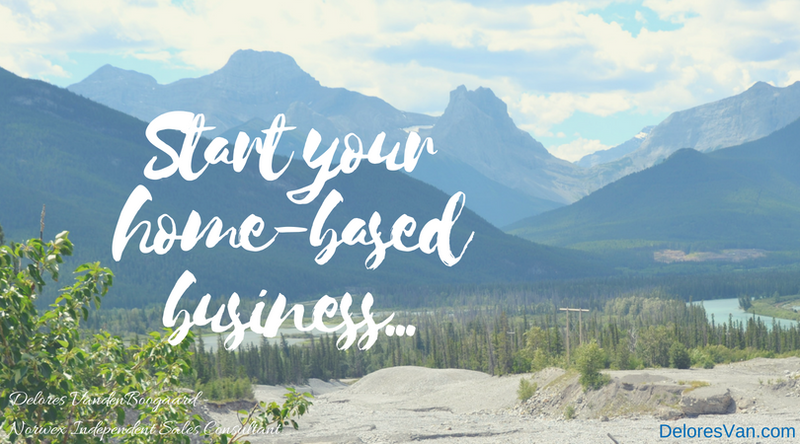 Your Norwex home-based business will be off to a GREAT start. Having a plan and setting goals is just what your business needs to be successful… why not give Norwex a try… a test drive, and get rewarded along the way. 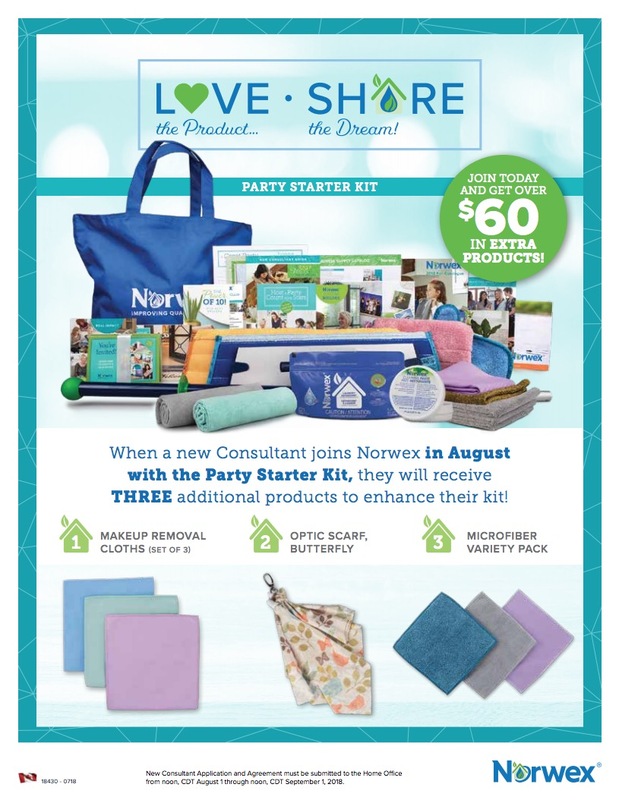 Silver Package: It is a great way to full your sales requirement to keep your Norwex account active while stocking your kit with great product and receiving some business supplies. You receive 43% off retail price for this kit. Gold Package: This is my favourite package. You not only receive 45% off the retail price, you receive lots of great product and business supply and when you buy it, you earn your FreshSTART Sales Step 1 ($143 in FREE Product). 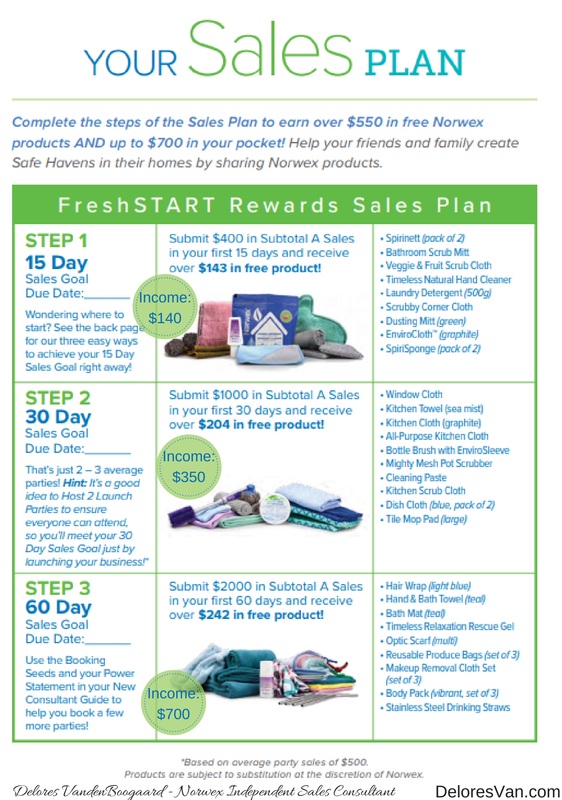 Every sale, including personal purchases, count toward your FreshSTART rewards! 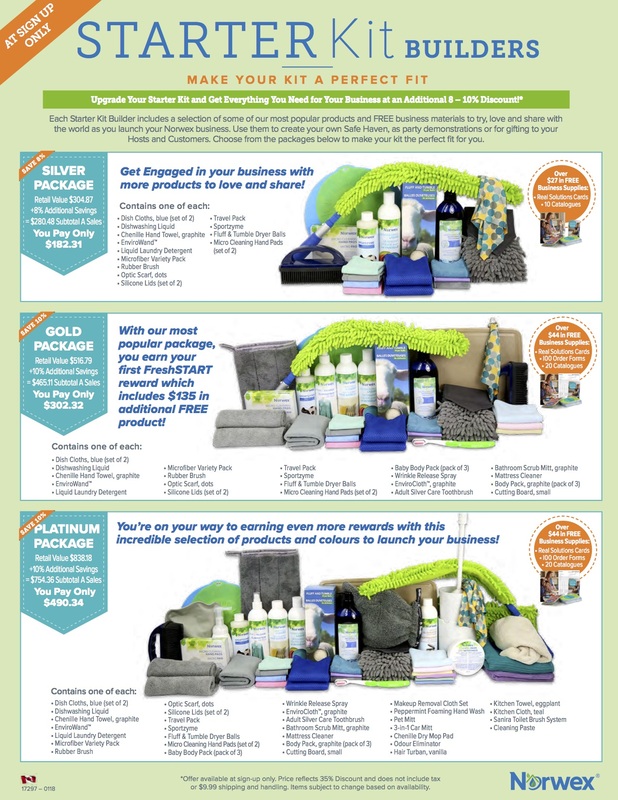 Platinum Package: Want a serious sampling of the Norwex’s products? This is the kit for you! It will give you enough for your demonstration kit, product for your personal use, your FreshSTART Sales Step 1 (and almost Step 2). It is for those who want it all! 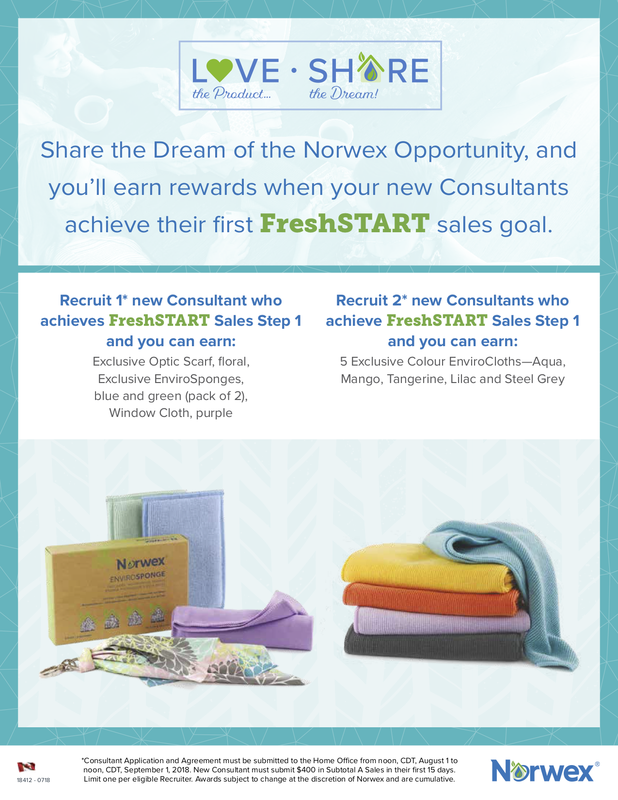 Norwex also rewards new consultants who successfully build their business by offering this business opportunity to one (or 2) more consultants right away. 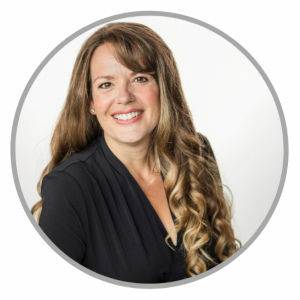 “Yikes!” you may be thinking… maybe you don’t even want to tell your mom about your new home-based business. But statistics show that consultants who sign up other consultants as soon as possible do better in direct sales that those who don’t. Why? This way you get to chose your co-worker, you get to do it together, learn, earn, grow, celebrate success, support each other… instead of doing it by yourself. 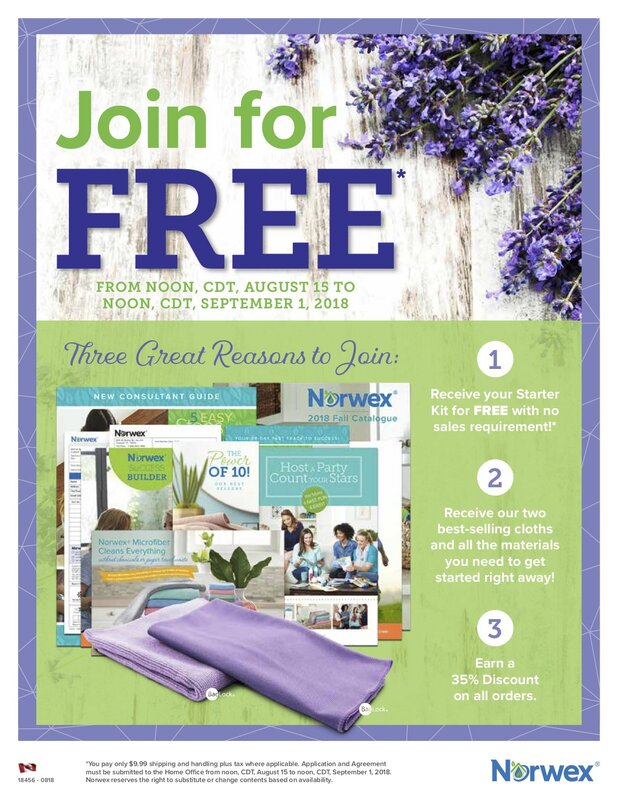 So, despite your sweaty palms, start thinking if you know anyone who loves the product and believes in Norwex’s mission to reduce chemicals in our homes. They would make a great addition to your business. 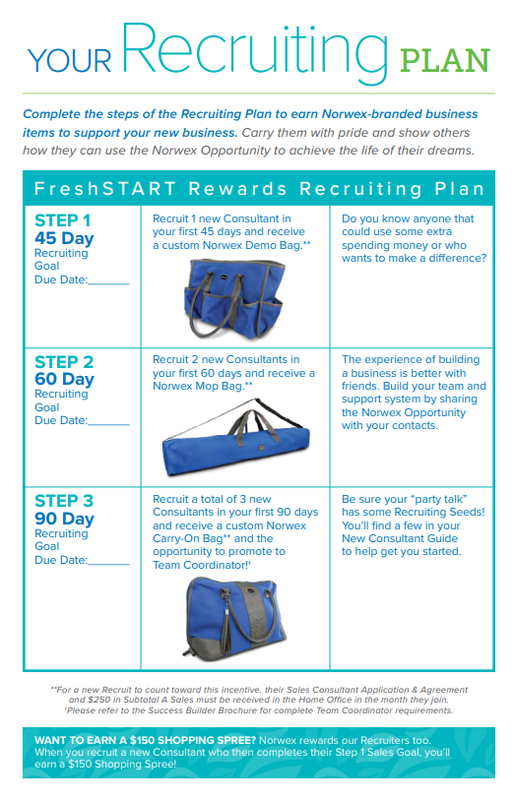 This month…When you recruit a new consultant (or 2) and they achieve the FreshSTART Sales Step 1… you will be rewarded with $150 Shopping Spree, additional FREE Product and Norwex-branded Business items! There is room for you at Norwex! I believe that until our supermarkets do not have large aisles stuffed with chemicals to clean and disposable paper products… there are not enough Norwex consultants. You have your own story about why you would like to join Norwex… I would love to hear your story and help you on your journey with Norwex. Leave me a comment about why you would like to join.